Ed Byrne is one of the most prolific comedians in the UK, and as an observational stand-up considered unrivalled. He has performed sell-out UK tours, West End solo runs and developed huge success on the International Circuit where he has performed to capacity audiences around the globe. Ed’s stand-up career began whilst he was a student at Strathclyde University, Glasgow. As student welfare officer he was often called on to MC events in the university and soon was being invited to perform at other third-level institutions around Scotland. It wasn’t long before he’d quit his studies completely and started up a small comedy club in Glasgow. From there, Ed moved to London, where he started all over again with open spots and short sets on the club circuit, honing his material and developing the curmudgeonly and nerdy persona we’ve all come to know. Ed’s television career is now in its 3rd decade! He has consistently made television appearances since his first break on Jonathan Ross’ Big, Big Talent Show in 1995. The BBC’s Stand Up Show was the platform though which really grew his television audience, establishing Ed Byrne as one of the UK’s best stand-up comedians. As an actor, Ed has featured in several films, including Round Ireland With A Fridge, Rat, Are You Ready For Love and Zemanovaload. Ed’s theatre work has included the lead role in Brian McAvera’s ‘Kings Of The Road’. Ed’s tours ‘Different Class’, ‘Crowd Pleaser’, ‘Roaring Forties’ and ‘Outside Looking In’ have enjoyed storming Edinburgh runs and tour sell outs. 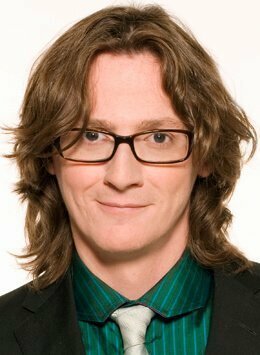 Ed Byrne is in great demand as an awards host and stand-up comedian for corporate events.